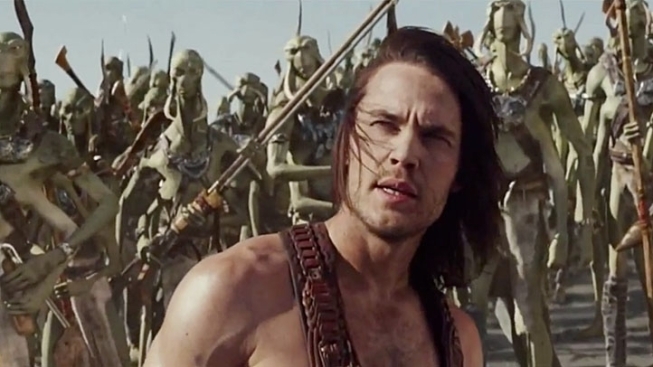 "John Carter" has been a bit of a roller coaster thus far. First there was the rush of excitement at the prospect of Edgar Rice Burroughs' epic being brought to the big screen by as renowned a storyteller as Andrew Stanton, the man who wrote much of the "Toy Story " trilogy and directed "Finding Nemo" and "Wall-E." But it's been mostly downhill since then. There was the poster with the giant "JCM" monogram, which was boring, but whatever. Then they changed the name of film to "John Carter," a title that couldn't be much more generic and gave no hint as to what it's about. Adding insult to injury, even after they dropped "Mars" from the title, they continue to use the "JCM" monogram. Check out the new poster below--how much more would that baby sing with the words "of Mars"? But we love Taylor Kitsch, and Martians, and sci-fi battles, so we're keeping our fingers crossed.